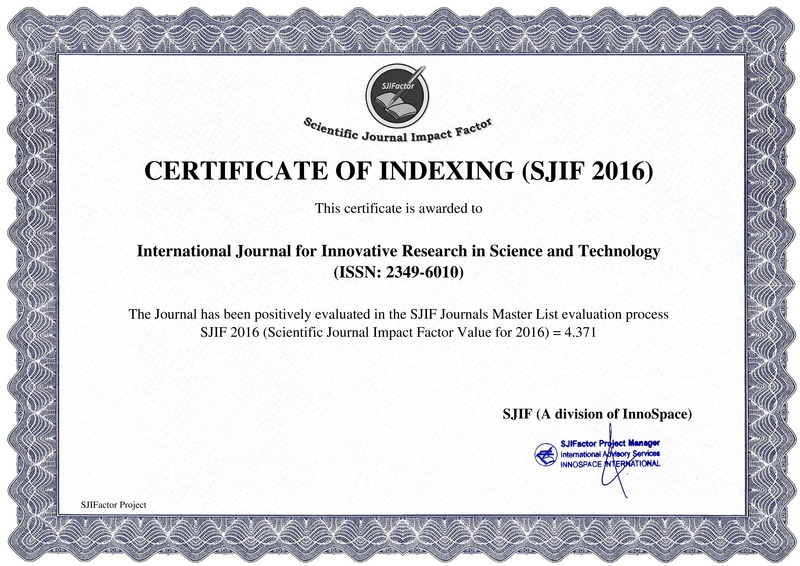 Q: What is the ISSN number of IJIRST (International Journal for Innovative Research in Science & Technology)? Q: Is IJIRST (International Journal for Innovative Research in Science & Technology) an Open Access Journal? A: Yes, IJIRST (International Journal for Innovative Research in Science & Technology) is an international peer reviewed, open access, online journal. A: Submit your manuscript electronically at Submit Paper. To submit a manuscript electronically you need to convert your files to MS-Word format (.doc or docx extension). A: You can find the Author's Guidelines in IJIRST (International Journal for Innovative Research in Science & Technology) Menu. Q: Why should I transfer copyrights to IJIRST (International Journal for Innovative Research in Science & Technology)? A: Like many other scientific publishers, the IJIRST (International Journal for Innovative Research in Science & Technology) requires authors to provide transfer of copyright prior to publication. This permits IJIRST (International Journal for Innovative Research in Science & Technology) to publish the article and to defend against improper use i.e. publishing in other journals. It also permits IJIRST (International Journal for Innovative Research in Science & Technology) to mount the article online and to use the article in other forms or media. By the IJIRST (International Journal for Innovative Research in Science & Technology) transfer agreement, the authors retain substantial rights in the work. A: The review of articles, is done through a blind peer review. All the articles received by IJIRST (International Journal for Innovative Research in Science & Technology) are send to Review Committee after deleting the name of the author to have an unbiased opinion about the research. Q: Are IJIRST (International Journal for Innovative Research in Science & Technology) published articles available for free? A: Yes, all the papers published by IJIRST (International Journal for Innovative Research in Science & Technology) are available to download for free. We are here to support the Open Access. Q: What is the frequency of publication of IJIRST (International Journal for Innovative Research in Science & Technology)? A: IJIRST (International Journal for Innovative Research in Science & Technology) is monthly journal. It publishes one issue per month. Q: Should I join IJIRST (International Journal for Innovative Research in Science & Technology) on Facebook? A: We invite all scientists, researchers, academicians and students to join IJIRST (International Journal for Innovative Research in Science & Technology) on Facebook. Joining on Facebook demonstrate your support to us. Join us on Facebook.